Christianity spread like wildfire in sixteenth-century Japan. By the 1580s, less than forty years after Francis Xavier introduced the faith, the church counted two hundred thousand converts. The growth had proceeded despite the opposition of Buddhist priests and many petty rulers. However, in 1587, Emperor Hideyoshi ordered the banishment of all Catholics, forcing the Jesuit missionaries to operate from hiding. But outright persecution did not break out until late 1596, when Hideyoshi rounded up twenty-six Jesuits, Franciscans, and laypeople and prepared to martyr them. Among the victims was St. Paul Miki, a Jesuit novice who had just completed eleven years of training. Paul’s noble family was converted when he was a child and at age five he was baptized. Educated by Jesuits, the gifted youth joined their novitiate at age twenty-two. He had studied intensively the teachings of the Buddhists so as to be able to debate their priests. He welcomed his chance at martyrdom, but may have wished just a little that it would be delayed long enough for him to be ordained a priest. Hideyoshi had the left ears of the twenty-six martyrs severed as a sign of disrespect and paraded them through Kyoto. Dressed in his simple black cassock, Paul stood out among them. Most onlookers realized that this noble young man could have worn the samurai’s costume with two swords on his belt. The whole display had the unexpected effect of evoking compassion from the crowd, some of whom later became converts. When the crosses were set up it was a wonderful thing to see the constancy of all of them. Our brother Paul Miki, seeing himself raised to the most honorable position that he had ever occupied, openly proclaimed that he was a Japanese and a member of the Society of Jesus. And that he was being put to death for having preached the gospel. He gave thanks to God for such a precious favor. As they awaited death the entire group sang the canticle of Zachary (see Luke 1:67-79). The executioners stood by respectfully until they had intoned the last verse. Then at a given signal they thrust their spears into the victims’ sides. 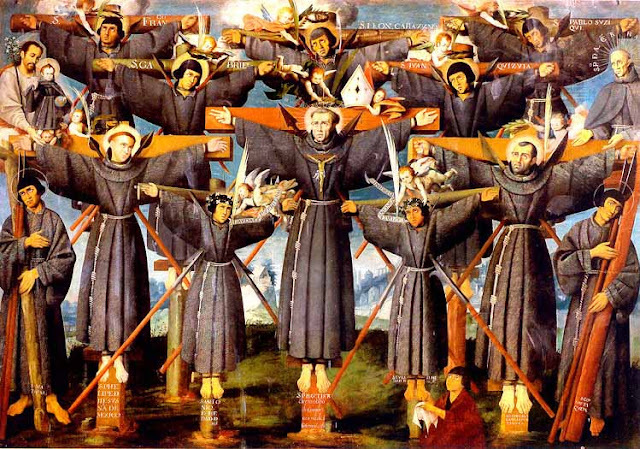 On that day, February 5, 1597, the church of Japan welcomed its first martyrs.